How Will I Use 2014? With a New Year beginning, many of us will look back over 2013 and just what we accomplished or did not accomplish. We may have begun with good intentions but fell short of some of our goals; after all, it is not easy to sustain some intentions and consistency over a period of 365 days without great concentration of energy and effort. I don’t make New Year’s resolutions. Instead, I live one day at a time and measure my progress against the previous day, and all that against eternity. I ask myself if today I did better than yesterday, and if not I don’t deride myself for failure but keep trying. No, I don’t tear myself down as it does no good. I do my best and that is all I can do. From many years of watching my life, nothing more is needed or possible. I do not carry stories that I should have done better. The reality is I did as I did; end of story. I stay away from perfectionists, they are no fun. And besides, I am not always sure that they are honest with me or themselves. Please understand that I do not think we should not try and do our best. But it all must be observed in the larger scheme of things, and that scheme includes both so-called success and failure at success. In the spirit world, there are those who live for the love of truth, and then there are those who live for the love of love. The latter individuals are higher than the former, as the highest truth in the spirit world is unconditional love. It is the essential love in the heart of God. Above all, I am trying to set the tone for this new year, that we may all do better by easing up on ourselves—if we are too hard on ourselves—to allow for both success and failure; that after a time we find ourselves where we wanted to be, and reality figured in greatly to bring us there as long as we keep on keeping on. Life is not just a straight road toward a goal, and it is not a journey without variations or incidents or unexpected changes. It is why some have said that the journey is the most important part, and the goal is secondary. My life experience tells me that this is true. Besides, on the other side of a goal is more journey and more goals! To be fair to ourselves in life, as I alluded to it, we must measure ourselves against the backdrop of eternity. It is one thing to be diligent in spiritual discipline and endeavors, but not at the expense of not living in reality. I have worked with individuals where, because they couldn’t deal with reality they denied reality, acting as if what they didn’t want to happen didn’t happen when it did. Some of them are individuals who are mostly concerned with the appearance of things and not with the reality of things themselves. As long as on the surface things appear good, then face is saved and false pride maintained. People around them (including family, friends, and work associates) are caused to be dishonest, can’t grow, or form relationships of trust or true love with them. Love to such people is manifested toward them in adherence or obedience to truth, half truths, and/or complete falsehood; whereas, divine love loves because we are, not because of what we are. It cannot possibly be different, as God dwells in all that is created! I have seen this in religious zealots who raise their children by way of some form of inflexible spiritual teachings, making their theology more important than the love in their family. It is amazing how quickly the parents change when, in fact, their child does not conform and does not obey. The strictest of parents will, in the name of principles, cut their child off as if they no longer exist. Those who still have a heart begin to look at their child in reality, as an individual with their own life course–a course they, for better or worse, must follow–for it is their life, perhaps, even their destiny. It is not when a child is absolutely obedient that the parent learns to love unconditionally. Absolute principles do not allow for error; love does–and love is higher than any teaching. Because unconditional love is the ruling principle of the universe, forgiveness is possible. Yes, truth must guide love; but when truth is not absolutely followed and one deviates, love makes it possible to go on and love, attended by forgiveness, allows one to move forward and not remain imprisoned in perpetual guilt and remorse. Jesus, it seems, understood that love was most important, for he readily forgave individuals of their sins and sought to heal them. God may be all powerful, but not more powerful than the love existing innately and deeply within his/her heart. Love is the ruling energy of all the universe, spiritual and physical. Recently, someone sent me a recording of a spiritual reading in which the medium picked up an entity who said that upon arriving in the spirit world, he learned that love was the most important thing; indicating that he had failed in love. I knew this particular individual very well when he was on earth, and I knew him to be forcefully fixated on his brand of truth, even at the expense of his own wife, children, and many others. Now in spirit, he finds himself coming back to apologize to those whose lives he affected in this warped, imbalanced way where he made his truth more important than love. Where are we in our efforts to awaken to the reality of the spirit world? What will we do this year to gain both more understanding and life experience toward opening our spiritual senses, that we may tune into the spirit world readily and reap the benefits from such efforts? In general, what are we going to do about our overall perceived spiritual needs? It is obvious that you would not be reading this blog if you were not interested in your own spiritual awakening and growth and the spirit world. This year I will begin my outreach in the very area of teaching others about their spiritual self and the locating and opening of their spiritual sensing of the spirit world. I teach from my life experience, not from books or what others have said. After many years of mediumship, the spirit world is primary in my life, and the earth plane, while not secondary—as the spiritual and physical go hand-in-hand—is definitely a lesser concern than my relationship with my eternal spiritual self, the spirit world, and God. If you desire to fulfill some long awaited goal of deeper and higher spiritual awakening, I hope you will join me. This could be the year of your new awakening and a new beginning in your spiritual life. Many students have told me that my approach is simple, yet profound. I have sought to base my classes upon sound, time-tested spiritual principles and practices. What I teach you is what I was taught and learned. 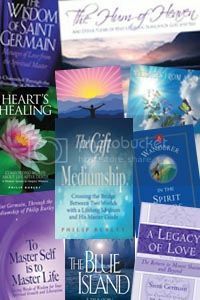 It is what I have utilized for nearly thirty years, and it has served me more than well in my spiritual outreach and especially in doing spiritual readings for thousands of people, which also includes the channeling of beloved Saint Germain. I hope you will join me and all of those who are just waiting for such an opportunity who have asked me many times when or if I would teach them to do what I do. Initially, I will; but for yourself first; and if you wish to go further with my more advanced classes, that is up to you. The least to greatest journeys both begin with the first step! Have a most blessed 2014…. P.S. This year I will not be posting content on Head in the Clouds, Feet on the Ground every week–but rather, more sporadically. Because my calendar will be taken up with an increased number of activities this year, I simply will not have the time. However, if you are signed up for this blog, you will be notified by email each time I publish a new post; and any comments you may write will be posted as well. Looking forward to the meditations! Thank You Heavenly Parents!! Thank You Mr.Burley! Hooray!!! I enjoyed your post very much. It contains a grounded perspective of balance and love that is the balancing element between two worlds, making them one. Excellent. You are so clear when you write and speak. In the brief time that I spent with you many years ago, you forever affected my life, Philip, and your words have echoed in my life time and time again. Happy New Year! Thanks very much for that reminder of the priority of Love. For many years I was convinced truth was the priority and my inflexibility led to my eventual divorce. Since then (10 years ago) I've had to re-examine my faith and over a period managed to wake up to a new dimension of non-judgement and tolerance. Your book from Saint Germain (To Master Self Is To Master Life) helped me immensely on that journey. (For that I will always be grateful) To understand deeply who I Am is my goal from now on and to be empowered by that understanding . Thank you so much for your inspired efforts to support others on that same journey. It is nice to hear from you and have you join in our postings for this blog. The life experience you have shared echos the sentiment and meaning of what I have shared in this New Year’s post. Life experience is the greatest teacher of all and from early age to old age we are caused to examine and sometimes change not only our thinking but also our actions in a number of situations and religion, spirituality, and faith may be among them. I so appreciate and respect your courage and humility in sharing your precious words with all who read Head in the Clouds, Feet on the Ground. I am doing a values based coaching program this year. I am surprised how hard it is for me to get to my core values and not feel wrong for having something I own and believe in. I want to merge your goals and mine to help me grow spiritually and physically this year. You are welcome Juliet. Have a rich and most meaningful 2014! Many Blessings, Much Love and Much Gratitude! Your words touch my heart deeply Yanni. Not because they are aimed toward me but because there is a yearning in the hearts of many I meet who are awakening to the realization that they are the temple of the living God who not only loves them and embraces them now but for eternity. To me all of the exchanges in this blog setting are God speaking to God! Happy New Year dear Yanni God! Truth is inseparable from who you are. The very Being that you are is Truth. Jesus said: ‘I am the way and the truth and the life.’ Jesus referred to the innermost ‘I Am’, the essence identity of every man and woman, every life-form. He speaks of the life that you are. Christian mystics call this the ‘Christ within’. When you are in touch with that dimension within yourself—and being in touch with it is your natural state, all your actions and relationships will reflect the oneness with all life that you sense deep within. This is Love. Laws, commandments, rules and regulations are necessary for those who are cut off from who they are, the Truth within. Remember heaven is within my heart, opening my eye to the sacred in all things and breathe prayers of thanks into each moment, and reverence honor the gift this life brings. Remember we are all children of heavenly father: kindred spirits, brothers and sisters, members of the great family of LOVE. So beautifully said and I cannot add anything to it but thank you! Thank you so much, Philip! If we all lived by the creed of unconditional love, this year would become the best one ever! I am so grateful for your deep insights! Can’t agree more. Thank you Charlotte for your dear sharing. I will use 2014 to consistently place my attention more on loving self, going within, and remembering I am so cherished and loved by God. When I remember this, all feels good. It is so much easier to then look outside my space from a loving perspective, offering forgiveness instead of judgment. Just last night I attended my second Meetup activity — Free pool in a smoke-free environment, with local singles in the area who are in their 30s and 40s. I was having a fun time. It was a big turn-out, too, with over 20 people there, sharing two pool tables, mingling and watching the game. A man came in towards the end of the evening, and I immediately recognized him. See, when I first moved to Viginia, I signed up on a dating web site. Long story short, I met this same man, who had walked into the pool hall, two years ago because we briefly dated. Both he and I said some not-so-kind words to each other back then, both of us hurt/offended by what both of us had said to each other. So last night when he walked in, I immediately regretted my actions from two years ago, remembering the things I had said in anger back then. I chose not to approach him last night. But when I got home that evening, I found his number in my rolodex and left him a voice-mailed message, apologizing for my harsh words and unkind actions two years ago and truly wishing him the best for 2014. Of course, I saw last night how I was not coming from love back then. This was a really great experience for me, because I quickly realized last night it is I, too, who gets to lovingly hold myself with forgiveness and understanding, bringing my attention back to loving myself as God loves me, seeing myself as God sees me. Thank you, Philip (and all who help you), for giving and sharing of your time and love. Oh, how I appreciate it. I cherish your story as it says it all and lends living proof to this New Year’s blog post. Because there is eternity ultimate perfection is possible but on the way we are all taught life is given for learning and growing and that the most important thing is love. So….it may take each of us significant time and patience to see ourselves through to the end, to perfecting our ability to give and receive love. Thanks for taking the time to share. This is good reading and runs in the vein of my truth. The beauty that lies within each and everything is where I like to put my focus and when I drift from that I notice that I get into judgment and that kind of energy. I like what you say about not beating yourself up. I'm with you in Love as we journey into 2014. I remember our last meeting in which I was so very happy to see you. Again, I am very happy to hear from you. Over all of these years you have remained steady and loving and I have been a recepient of that God-given nature. You are welcome. Don’t be a stranger. You can count me in as one who will attend your classes with an open heart and an open mind. Since I was a teenager and began to question my Catholic upbringing, I have been a searcher of spiritual truth. I have pondered this question in the past: What is higher, truth or love? (So I am glad you brought it up in this blog.) I have come to the conclusion that one can have truth without love, but one cannot have love without truth. Love IS the highest spiritual principle. Being human makes it difficult to stay in a love-filled place all of the time, but I know that is what I am here to learn. Though it sounds paradoxical, I believe that failure is the best teacher. I learn more from my failures than I do from my successes, but don't get me wrong–I don't welcome failure! Anyway, I cannot wait to start the classes! Thank you for the opening sentiment of a Happy New Year! I look forward to having you in a circle of also conscientious souls yearning for spiritual truth and spiritual experiences! I cannot add more to your heart-felt words. You wrote, "The strictest of parents will, in the name of principles, cut their child off as if they no longer exist. Those who still have a heart begin to look at their child in reality, as an individual with their own life course–a course they, for better or worse, must follow–for it is their life, perhaps, even their destiny." These words spoke so deeply to my own experiences, especially this past year. While I never physically cut off any of our children, I had felt a growing rift due to our varying spiritual beliefs. One incident especially comes to mind, when my son was struggling so much. Rather than let him come home, I encouraged him to toughen up and stick it out. Clinging to my own truth, I literally walked away from him. It truly broke my heart. I placed my perception of the truth above his need to be loved and embraced. He felt so isolated. He endured for two more months, then came home anyway. Years later, it finally occurred to me that I needed to say "Sorry". I apologized for any and all mistakes I might have made, in my own ignorance, to provide him with what he needed at that time. After I apologized to him, our relationship became more open. Another thing that helped me was something I learned in a spiritual reading: I had to let go of my concept of what a "perfect family" was, and give my children the room to grow and learn in their own way. This wasn't easy! But once I relinquished my desire for "parental control", I began to feel less stress and more peace of mind. I continue to pray for our children and reach out to them and serve them on many levels. But now I have more respect for their abilities to come to their own realization of truth in their own way, and in their own time. I look forward to a new year of possibilities and spiritual growth. Thank you! Please continue to share your thoughts and heart with us when you have time and are moved to do so. Thank you for your kind words, Philip. Yes, even though it may sound blasphemous to some, our children are our teachers! I don't think we give them enough credit. Even little children. I'm so amazed by what they say, when I take the time to really listen. And they so love it when an adult actually LISTENS to them! Happy New year Philip, I look forward to your upcoming classes and meditations! Thank you Mary Sue. Love to have you. Your message resonates with how I feel about New Year’s resolutions, and is so well stated. I look forward to your offerings this year and am grateful to be part of this circle. Thank you for your kind words Jennifer. Very happy to have you as part of a circle that is made up of such quality, spiritual people and is growing. Let us see what the New Year brings for all of us! All of this was very ineresting. Happy New Year to All. Thank You. For whatever meaning it held for you, you are welcome. Happy New Year again! Thank you again, dear Philip, for your loving words and outreach. You are a treasure! I feel blessed by your encouraging words and also by the heart-felt comments. I used to be hard on myself for falling asleep during your prayer calls. One time I fell asleep and later heard myself snoring on the recording afterwards. I felt so embarrassed and confessed about it on a subsequent call and jokingly said that Edgar Cayce is the “sleeping prophet” and I am the “snoring prophet.” Your words of encouragement to those of us who find it hard to meditate helped me be patient with myself and I did not feel judged anymore. I am learning to consistently tune into God’s unconditional love for me and other people too, knowing that God is working uniquely in all of our lives and that we need to be patient with the process of life as it unfolds…..
Blessings to all for a Loving 2014! Thanks John. So well put. To me the main thing is earnestness in seeking to realize just who we are. Whether or not we reach that personal revelation won’t matter if it is while in so called meditation or not. When the time is right Providence cuts through everything and enlightenment comes. A wealthy woman in England received her enlightenment as she focused on things before her in nature. As she did so her awareness was altered and self and God realization came. To me the major mantra for all of this is to drop all stories as to what should happen and keep on keeping on to allow to happen what will in God’s time. I think of you and your wife often. Leave a reply on "How Will I Use 2014?" Click on the book covers to visit Philip's Bookstore and browse through the books currently for sale.